William McMillan has been regularly attending sessions with Streetsport for over 8 years and now volunteers with us in his local community, Northfield, on Friday nights. “One day a friend took me along to Streetsport. I played football, basketball and made new friends. But more than that it became a safe space for me to go every night after school”. “Streetsport became like my extended family and a place where I could forget all my worries. It kept me grounded and calm and gave me the belief that I can achieve all my goals and dreams”. William also added that Streetsport “will never know how much I appreciate the time and effort they have put in to me”. 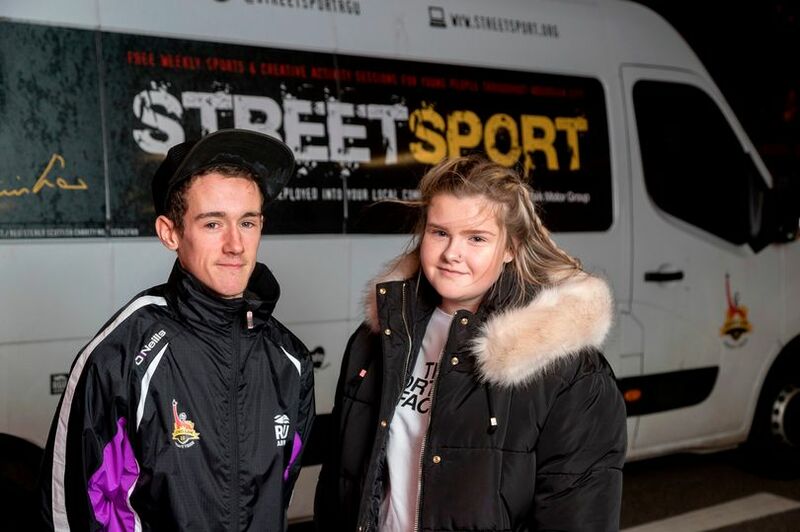 Streetsport volunteers: William McWilliam and Lauren Cran from Northfield, Aberdeen. Also from Northfield, Lauren Cran, now 14, has been attending sessions as a participant for 3 years and is now using Streetsport for the volunteering and physical sections within her Bronze Duke of Edinburgh award. Having admitted to being in the wrong crowd initially, Lauren says that “Streetsport transformed my life”. “For the first time I was listened to and treated like an adult, I’ve not got in trouble since. I go every night and either play tennis, hang out or get advice”. “They give me mentoring and the confidence that I can succeed in everything”. Mark Williams, Chief Operating Officer of the flagship programme, added: “it’s about giving free sports for kids to enjoy in a positive environment. Communities have become closer, safer and healthier at the same time”. All of us at Streetsport are very grateful for William and Lauren’s dedication to the organisation and we’re delighted with their endeavours as volunteers. You can view the printed article here.